SFI is the leading original equipment manufacturer for a number of industries, operating state-of-the-art production facilities across the United States. 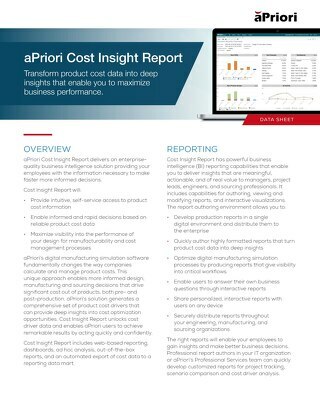 So was their adoption of aPriori’s innovative product cost management solutions able to give these new facilities an even greater advantage over the competition? 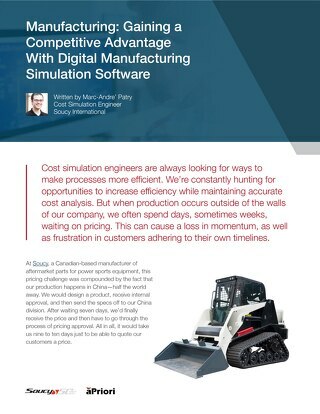 After eliminating their manual quoting process, and replacing their off-the-shelf cost management solutions with custom tailored solutions, the positive results were clear! 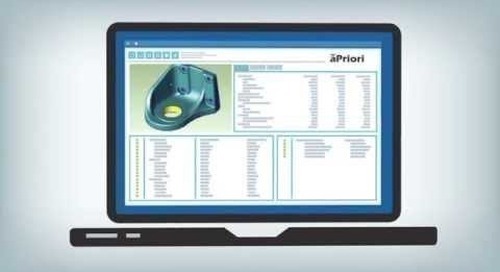 Find out how this best-in-class operation used aPriori to drive business growth, and offer their customers the best price, value, and reliability when estimating design costs. 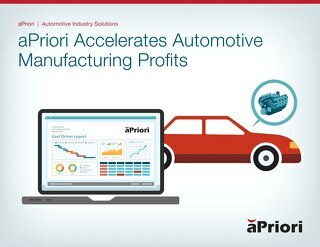 aPriori’s patented product cost management technology platform enables all members of your automotive product team to receive instant feedback on the cost of feature/value trade offs. Watch this demo. 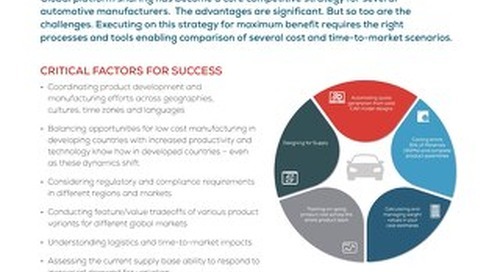 The latest automotive industry trends are creating enormous opportunities for auto suppliers. 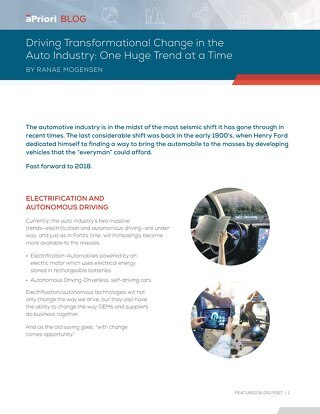 Manufacturing vehicles for electrification & autonomous requires mfg. significantly different parts. 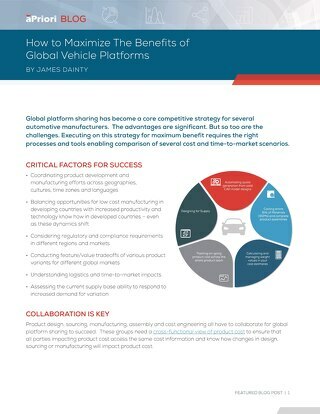 Executing on a global vehicle platform strategy for maximum benefit requires the right processes and tools enabling comparison of several cost and time-to-market scenarios. Learn more. 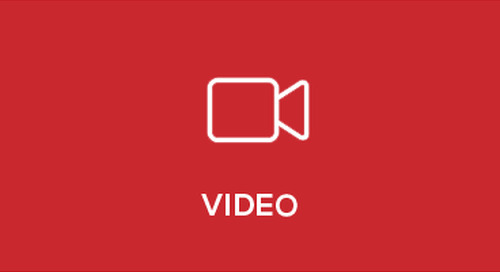 Watch this video to learn how a product cost management program can have massive impact on margin expansion in the automotive industry. Smith Thepvongs, VP of International Business, describes how Wuzheng identified savings of more than $1million using aPriori PCM as part of their Design-to-Cost strategy. 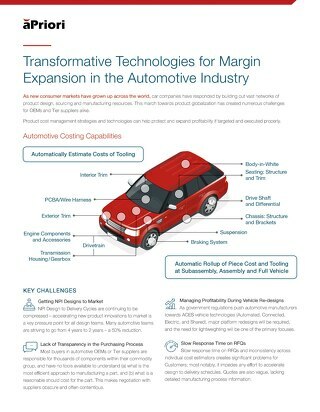 Looking for margin expansion in the automotive industry? 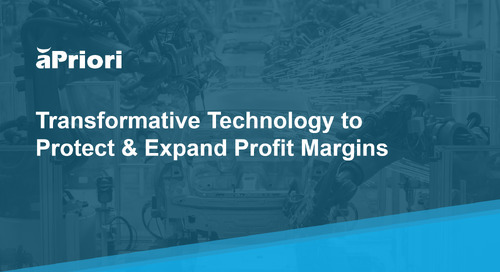 Read about aPriori's transformative technologies that can help both OEMs and Tier suppliers.